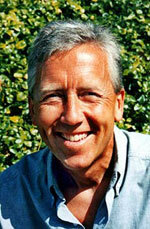 Hello, I'm Barry Heermann, author of Noble Purpose, educator, organizational consultant to corporations and non-profits for over 25 years, and I have two questions for you. Are you accomplished and successful in your life and work, yet feeling disconnected from your passion and purpose? Do the following comments describe your perceptions more exactly? You know deep inside that you possess a Noble Purpose - a signature way of being of service in the world that is yours and yours alone. You know that when you're expressing your purpose - even if you are not consciously aware of what "it" is - you are energized, powerful and fulfilled; and when you lose touch with it, you feel powerless, small, out-of-synch, and diminished. You know when you are feeling diminished and powerless that working harder, more frenetically, compulsively, obsessively, does not realize your purpose. You've tried at various times to "break the cycle," reading books, attending workshops, or taking vocational tests, but such "information" rarely provides ongoing access to your passion and purpose. With very few exceptions, thousands of professional men and women I've worked with over the years have had exactly this same experience. The problem in discovering your own pathway to purpose is that Noble Purpose is seldom revealed through our thought processes. Oddly enough, it emerges best when you are able to access and trust what is often called intuition. Find out for yourself. Enroll in the Noble Purpose Teleworkshop and participate in a series of five one-hour sessions, for five consecutive days. You will access five inspiring, fertile states of mind that will free you of obstructions to your purpose and open the way to stunning new realizations, shifts in reality, and a new capacity to create in the world. In fact, as you continue to work with these Noble Purpose states of mind over time, you will realize the life you love and always imagined. The Noble Purpose Curriculum is based upon 25 years of research into extraordinary work performance. In one of my prior books, Building Team Spirit (McGraw Hill), I presented these findings as they relate to teams and organizations. 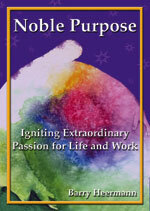 My new book, Noble Purpose: Igniting Extraordinary Passion for Life and Work (QSU Publishing), shows how these findings relate to individuals and serves as a key resource in the Noble Purpose Curriculum. My confidence in the value of the Noble Purpose Curriculum, however, does not rest solely in research. It rests in experience. Since 1991, I have facilitated personal discovery of extraordinary purpose with thousands of employees in organizations like AT&T, General Motors, NCR, Volkswagen of America, and the American Red Cross. Let us know if you would like more information about Noble Purpose, order the book, Noble Purpose, Igniting Extraordinary Passion for Life and Work, or enroll in the Noble Purpose Teleworkshop, the first of a series of Noble Purpose Curriculum offerings. You can call us at 937-767-0280 or send an email to . The following is an interactive presentation. It will engage you and it requires you to click on the blinking purple dot to advance the "slide show". the book by Barry Heermann NOW! 11/10/2016 | Website Designed by Babilon Arts, Inc.